Do you use vegetable broth or stock? 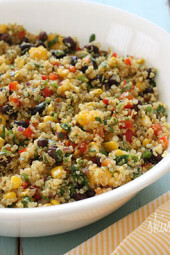 This recipe is delicious!! I typically don’t eat a lot of soup because at restaurants or from a can it’s typically too salty for my taste. But I was craving something a bit more fall oriented and I decided to spend a free evening cooking something that takes more care and time than I typically take to cook a weeknight meal. Man, am I glad I chose this one! I chose to go with the actual pumpkins and not the canned stuff which was definitely the right call (although for time’s sake I’m sure I will resort to canned pumpkin in the future). I also reserved the seeds and made SMOKY BBQ SPICED PUMPKIN SEEDS (also a SkinnyTaste recipe, and also delicious). Thanks for sharing! This was well worth the effort. Make the bowls: Preheat the oven to 400 degrees F. With two of the pumpkins, use a paring knife to cut a large circle around the stem of each pumpkin (make a zigzag cut, if desired). Remove the lid and scoop out the seeds and fibers. Sprinkle the inside of each with 1/2 teaspoon each sugar and salt. With the remaining two pumpkins, cut them in half vertically and scoop out the seeds. Place all the pumpkins and lids on a baking sheet; roast until tender, 35 to 50 minutes, depending on their size, until tender. The link that explains how to roast pumpkins for pumpkin bowls did not work for me. Is there another link I can use for that recipe? How many days in advance can I make this if I want to serve it on thursday for thanksgiving. You can make it up 2 days in advance. Love this! Actually added a little bit more sage than this called for. And the second time I made it, I added some white beans to add some protein. Great both times! Definitely a keeper. We had pumpkins and sage from our garden, so I decided to try this. LOVED it. Definitely going in the cook book. I was so tempted to add other spices, but I refrained. The Greek yogurt garnish added just that little extra something to make it extraordinary. I tried the link for roasting pumpkins but I couldn't find that on the site it sent me to. Maybe it needs a new link? If I use acorn squah, how much should I buy? I made this tonight. I think I added too much salt–I forgot about the salt in the broth… But I think otherwise it would be really good! I also used a blend of dried spices because I didn't have sage, and omitted the shallots because I didn't have any. So I guess the point of this post is that the soup is forgiving, except when it comes to salt! I did the same thing! I read that if you use the regular broth, plus salt, and you let it boil too long (thus boiling off the water and leaving the salt) soup can easily be too salty. Quick fix: 1 tsp sugar + 1 tsp vinegar seemed to do the trick! I made this tonight for dinner for mom and I. Thirty six degree weather + hot Roasted Pumpkin Sage Soup = 2 thumbs up. Yummy. Mom said more spice would kick it out. I told her since I was using dried rubbed sage I was afraid of using to much. I will add a little more when I heat up the left overs. I think I have another keeper. Thanks Gina. Excellent with fresh Marjoram also! Garnished with a few roasted pumpkin seeds. Thanks Gina! when I go to click on This method to get recipe for making the pumpkin bowls it send me to a weird link? 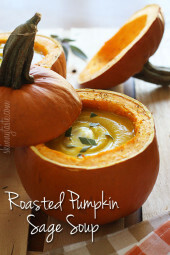 is another place I can find how to make the pumpkin bowls? Perfect for my teenager and my 13 months old baby! thanks Gina we LOVE your recipies!! I can made them everywhere!!! This was my dinner this evening. It was incredibly good. Once the pumpkin was well cooked and cooled, the skin of the pumpkin peeled right off. It's so filling and yet so low in calories. Fantastic find! Hi! I just made this and it's so delicious! What a great way to use up all of those harvest pumpkins. This recipe is a keeper. Love your site. It is a lifesaver for me with staying on weight watchers! And my husband, a former pro chef, enjoys eating all the food I've made from your site! Thank you so much for your lovely recipes. I made this pumpkin soup recipe tonight with ingredients I had on hand and so I modified your recipe quite a bit. I used 2 cans pumpkin puree and also added a large can of FAT FREE evaporated milk. I didn't have sage so I used dry marjoram and dried thyme instead. Garnished with a dollop of fat free plain yogurt on top and Parmesan shavings. Yum! It turned out great and took 25 min total! Is it possible to do the pumpkins in the crockpot rather than bake for 1-1.5 hours? I just bought an immersion blender, I may break it in with this recipe! the seeds don't go in the soup right? Just the scooped out flesh? Made this soup and it is FANTASTIC! Thank you for sharing! Made this last night & it was delicious! I made this tonight – my very first pumpkin dish from scratch and my very first soup – and it was delicious! Gina, I absolutely love your site and recipes – I've been sending it/them to everyone I know who loves to cook! You're awesome!! I thought I had sage and just realized I don't. Is there another herb I can use in the place of sage? Sage is quite a unique flavor, perhaps fresh chives? Pumpkin soup is a favourite at this time of year and I really like the idea of serving it in pumpkins! Thanks Sarah, it's from Such A Time Designs on Etsy. 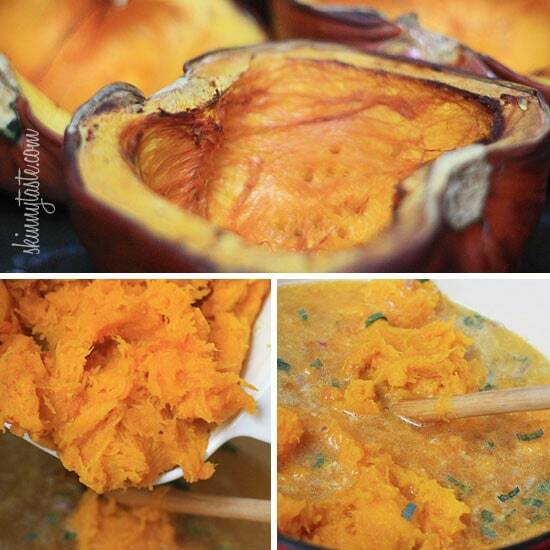 I am using canned pumpkin, should I skip the blender step? Do you know if this Pumpkin soup recipe cans well? And if so for how long cooking and hot water bath or pressure cooker? I heard you shouldn't can pumpkin. Am I cooking the "serving bowl" pumpkins? Or are they just raw? Just cook it to get some of the rawness out. Your soup looks amazing! So creamy and delicious.. yummy! Such beautiful presentation and what a wonderful idea! NOW I know how I'm going to use the chopped butternut squash I bought at Costco yesterday! As always, Gina, thank you for all you do. Through the women who cook your recipes for their friends and families, you're impacting millions. And, you're greatly appreciated. This looks fabulous! I have canned pumpkin on hand and will try that first. I'm veggie so I may try using unrefined coconut oil instead of the olive oil or butter…should be interesting! 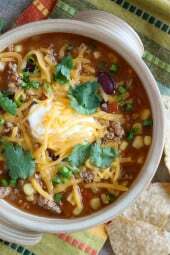 Thanks for sharing this recipe with all of us! coolest presentation of pumpkin soup ever! This weekend's pre-Halloween soup!! !…Could I sub dried sage?! Sure! For Halloween you can draw a spider web with sour cream! I think they suggested the olive oil if you want dairy free for lactose intolerant people. Def. going to try this as it gets colder. I'm confused about the bowl thing. 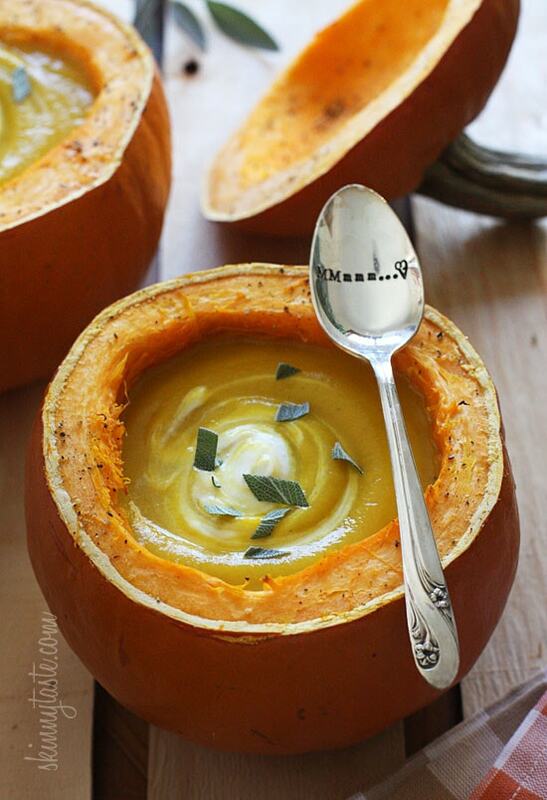 Are the bowls a different kind of pumpkin than what you use to make the soup? Same pumpkins, but I bought extra. I discarded the skins from the pumpkin I used in the soup as they were cut in half. This sounds great! I noticed you called for olive oil or dairy free butter, but don't understand why. What would happen if I subbed regular sweet cream salted butter? I used regular butter. I suggested for those who eat dairy free they can use oil. YUMMY! I just made a similar recipe after a conversation with my husband about how squash soups should be savory. I added some parmesan cheese which makes it less skinny but sprinkling a little bit on top would be a nice treat. A note about CARVING PUMPKINS: Please don't use them for cooking/baking. Most of the carving varieties are too fibrous and dry and are NOT yummy. So take the time to find pumpkin or squash that has been cultivated for eating and you'll be glad you did! 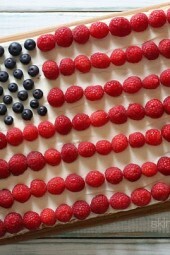 Beautiful photos and a wonderful recipe. 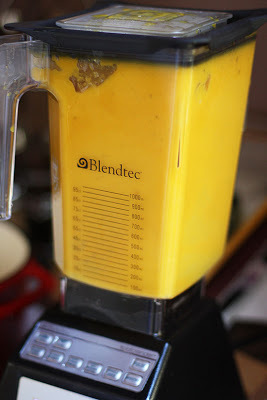 I love my Blendtec blender. It makes the most amazing velty smooth soups! Delicious Gina! The best recipes are always simple and use only a few natural ingredients. Holy pumpkin that looks amazing! Thanks for sharing! This sounds GREAT!! 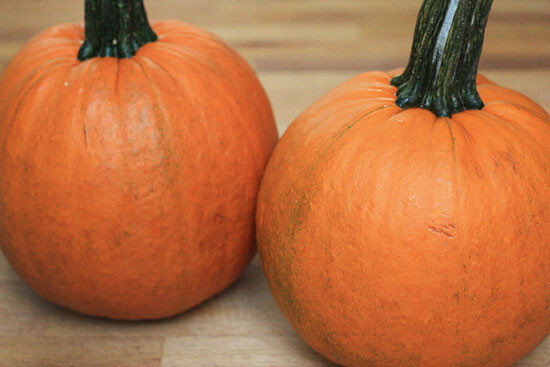 What are sugar pumpkins or pumpkin pie pumpkins? Are the different from what you carve for Halloween? Sorry for the silly question. They are much smaller. Regular pumpkin would work too. Would canned pumpkin be able to be substituted for the baked fresh pumpkin? I happen to have some canned pumpkin in the pantry! Whenever I don't have time to roast a pumpkin for a recipe, I use this great "cheat"… Put the canned pumpkin in a skillet or saucepan with a wide bottom (the more surface area the better) over medium heat for about 10 minutes. You'll need to stir it often. The pumpkin should dry a bit and turn a darker orange. It concentrates and caramelizes the sugars to give it a better pumpkin flavor, and it helps to eliminate the tinny taste from the can. I love that I know what I'm doing with the pumpkins on the porch now. 😀 Do you roast the pumpkins with the cut side up or down? Does it matter? I did it cut side up. Thanks! I have them in the oven right now for dinner tonight. Can't wait to try it and love that I shopped my porch for the main ingredient.